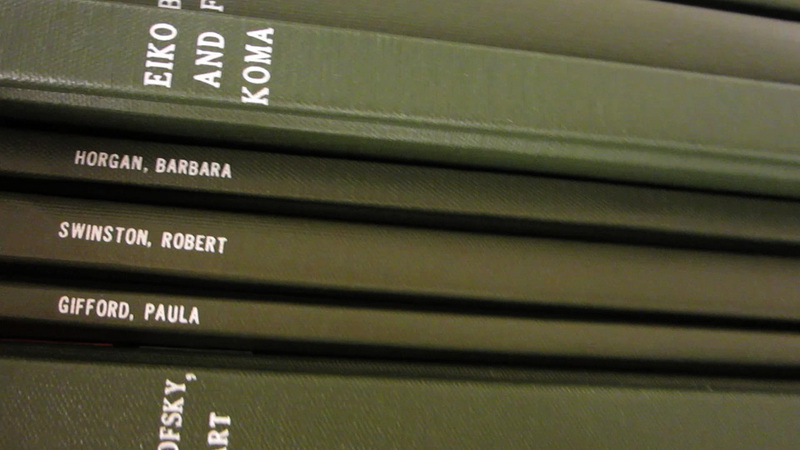 I spent part of my last semester at Pratt Institute conducting my own research at the Library for the Performing Arts in the Jerome Robbins Dance Division. Now as a Dance Heritage Coalition Fellow, it is my great privilege to spend time there working behind the scenes. A highlight of my work at the library has been to contribute to the launch of an online space for audio-visual materials, the Dance Oral History Channel. The process has afforded me the opportunity to work with some really inspiring materials from the Oral History Project, which is comprised of library initiated and recorded interviews dating from 1974 through the present. Participants in this collection include choreographers, dancers, and others like designers, critics, and those with other dance historical affiliations. Just a few examples are Alicia Alonso, Gerald Arpino, Glen Tetley, Violette Verdy, Clive Barnes, Anna Sokolow, Simone Forti, Martha Clarke, Irina Baronova, Twyla Tharp, Bill T. Jones, Maria Tallchief, Gene Kelly, the namesake of the Dance Division—Jerome Robbins, and the founding curator of the Dance Division—dance librarian Genevieve Oswald. To date there are over 400 of these recorded histories and accompanying transcripts housed at the library. A major purpose of the Oral History Project is to address gaps in dance documentation, which it accomplishes in a fruitful way. Because of the way dance forms are taught and passed from generation to generation, these Oral Histories create a narrative, and when they are placed together within the context of the collection, they help to weave a story – in this case, of dance in America. This brings up complex issues that performing arts archivists often brush up against and artists should consider as well; just how does one create a document of dance, not just the evidence of a performance, but of the art form itself, which is so elusive in its many expressions and methods of creation? The Oral History Project as a collection is a testament to dance curators and librarians taking careful consideration of just what makes dance as an art form unique and then moving to both generate and collect it. When materials are gathered in libraries and archives, they come to represent the culture, and also the people who work to preserve the collections. Physical details about costumes, performers, and lights, along with the photographer’s style and perspective come alive in a flash. Dance is a visual form, so this information is invaluable, but what about the elements of it that aren’t as readily accessible, the more obscure ones? In order to answer this question, or adequately gather, store, and create a full document of a work, the problem of a fixed form representing one that moves has to be taken into account. Because the currency of performance is time, and more than a single moment in an image could hope to capture, dance materials are often best understood amongst other ones which augment them by providing more context. As I have been working with Oral History collections, I have become increasingly interested in these details of dance that are perhaps not as easily captured, and most readily lost. In working with the materials, I have considered whether or not it is possible for an image to uncover the feeling of watching a performance, the way that a particular performer appeared to move out of the earth, or how the connection between two dancers changed the meaning of the movement. In documentation of performance, recording a likeness of the moment often falls short. In the drawings, Graham finds something about the complexity of recording movement. The liveness of the gesture is linked to why dance is stimulating for an audience. When the body moves in performance, the audience experiences a certain empathy. It isn’t so much the specific series of movements and stillnesses which matter, but rather the expression of life within the body, articulated through the dancer, also present in these sketches. Trowbridge captures Graham’s work as an X-ray might – void of color and information that could be seen by the naked eye. Her dancers are stripped of identity and recognizable persona, and as a result the lines delineate more than the form of the human body. 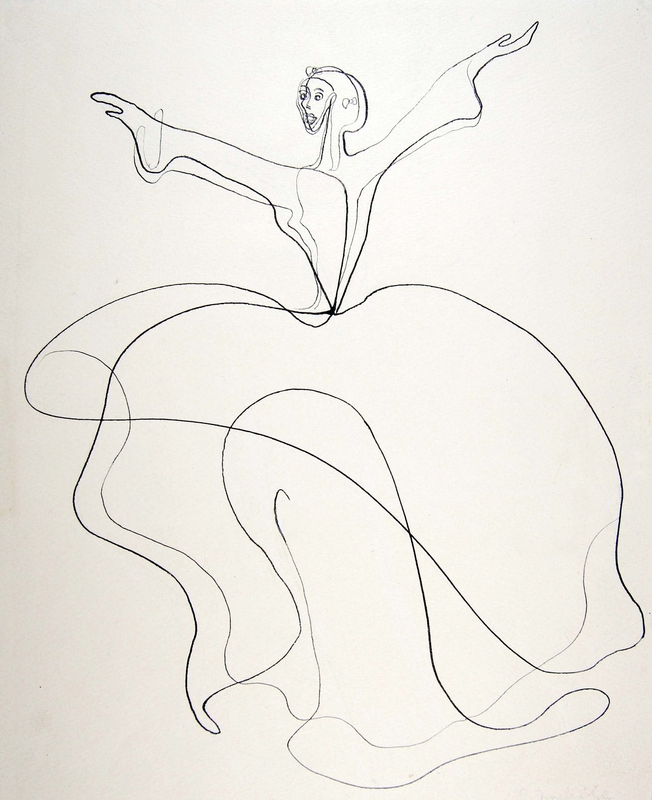 Each drawing is not an exact replication of the visual elements of a dance, but rather a document that captures the impulse and energy of Graham’s movement. The ink gestures point to an essential drama present in her work–the attempt to excavate the possibilities of truth in the action of the body.